Pictured above: William “Andy” Anderson with his wife. Officer Anderson has 65 years of combined service with the LAPD, 31 years as a full-time officer and 35 years as a reserve. 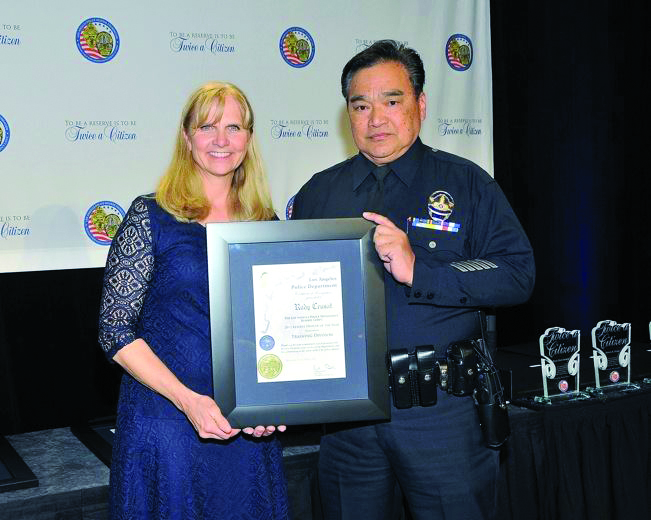 Los Angeles reserve police officers and specialists were once again honored at the annual Twice a Citizen Awards Dinner on Saturday, April 5, at the Westin Bonaventure Hotel, in what was the 40th anniversary of the original reserve dinner. Three community leaders were also recognized with Twice a Citizen awards. The Department Reserve Officer of the Year was Rudy Crusat, of Training Division. He has served as the primary mentor to reserve officer candidates for several years — from recruitment through the testing phases of the hiring process. Officer Crusat has distinguished himself by working over 300 hours. He also received the honor for Specialized Divisions. The evening was packed with honorees. The West Bureau Officer of the Year was Brian Pearcy (West Traffic Division), the South Bureau Officer of the Year was Sharon Abbott (Harbor Area), the Central Bureau Officer of the Year was Timothy Bragg (Northeast Area) and the Valley Bureau Officer of the Year was Gary Hall (Devonshire Area). For more detail about each of the Department and Bureau Reserve Officers of the year, see pages 12 and 13. Andrea Friedman was remembered. Andrea, who retired last November after 23 years of service as a LAPD reserve officer and 15 years as secretary of the Los Angeles Police Reserve Foundation (LAPRF), passed away on March 6. Her fellow officers at the LAX Substation were presented with the first-ever Friedman Award for going above and beyond in supporting the Reserve Corps — in escorting Andrea and her husband, Albert, a specialist with the Department, from her hospital to the airport, to a new life that was cut far too short. LAPRF Co-Presidents Karla Ahmanson and Michael Sellars welcomed the officers and guests, having been elected by the Foundation Board last December. The cover of the banquet program recognized “Andy” Anderson, who has a combined 65 years of service as both a reserve and a full-time officer. Officer Anderson was at the banquet, receiving a standing ovation and signing a few autographs. The Foundation co-presidents also recognized Reserve Policeman George Booker Mogle. Last September, his daughter, 87-year-old Luella Tralle, came to Los Angeles to receive his LAPD Purple Heart. Assistant Chief Sandy Jo MacArthur took the Chief of Police’s place in recognizing the reserve officers of the year and community honorees. Deputy Chief Mark Perez was also there to honor the officers, as Department reserve coordinator. Nineteen reserve officers received their 25-, 30-, 35- and 40-year service pins at the banquet. The three Twice a Citizen community leader honorees were Beau Boeckmann, vice president of Galpin Motors, Inc., who has been deeply involved in many community and philanthropic efforts; Steve Fazio, president and CEO of Fazio Enterprises, who served for many years as a Los Angeles reserve police officer and was later appointed to the Los Angeles Fire Department Board of Commissioners; and Melvin Kennedy, former president of the LAPRF and 32-year veteran reserve officer. The mistress of ceremonies was Christine Devine of Fox News. John Moschitta Jr. — perhaps best known as the fast-talking man in the FedEx commercials — was the live auctioneer. The annual banquet is funded by the LAPRF.